Do you own a business in St. Paul, Minnesota? If you own a business or are looking to build one, one of the steps to ensure that your building stays in good shape is purchasing commercial gutters. So why are gutters so important for you business? Having good gutters is a necessity when you own a business or a home. Gutters and downspouts are a necessary workhouse for your building to prevent decay, rot and structural compromise. When people do not invest in gutters immediately, they will soon regret that decision once they experience rain, snowmelt or a storm. Many people will discover that their basement is wet, crawl space flooded, or there will be pools of water at the outside wall of their home or business. If you allow your business to sit for a season or a year or two without gutters, you will experience serious damage that is irreversible. Although it is a slow process, it is steady and causes erosion over time. As this damage may not be noticeable at first, homeowners are often shocked at what has occurred the past few seasons or past few years. Uncontrolled water can cause damage to windows, walls and foundation. It can also stain and rot your siding, damage paint and rot window frames. When left for extensive periods of times, it can cause structural compromise to the foundation. So what are the best gutters? Now you understand why gutters are important, but you may be concerned with investing in gutters, and are probably curious if gutters will leak and the damage will occur regardless. Well, yes, gutters do leak. But not all gutters. When you purchase gutters, you need to understand the product you are buying. Stock gutters come in multiple lengths and therefore they need multiple joints and that is what causes leaks. Our industrial fabricating equipment allows us to create seamless gutters systems for homeowner at their location. No joints means no leaks. When you are looking to protect your building and need commercial gutters for you St. Paul business, make sure you are purchasing something worth investing in. 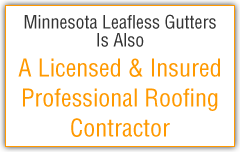 Minnesota Leafless Gutters provides the strongest metal gutters in the industry, gutter covers to prevent leaf build up and has more than 110 colors to choose from. Now you know the importance of gutters and are aware of why we take our job so seriously and want to provide our customers with the best products in the industry and with the best service. Call us today and we will help find you the best gutters that fit your business.